Anselm Feuerbach (1829–1880), Medea (1870), oil on canvas, 198 × 396 cm, Neue Pinakothek, Munich, Germany. Wikimedia Commons. Anselm Feuerbach (1829–1880) was the son of a famous archaeologist, and trained at the Düsseldorf, Munich, and Antwerp academies before becoming a pupil of the now-infamous Thomas Couture in Paris, at the time that the French Impressionists were also learning to paint. In contrast to the nascent Impressionists, Feuerbach was a painter of history and mythology in true Salon style: highly finished, and with the aura of complete authenticity. But look below the paint surface, and things were a little different. The Italian author Pietro Aretino (1492-1556) is probably as obscure now as is Anselm Feuerbach, and he makes a strange character for a narrative painting. In his day, he was a great influence on art and politics, and Titian painted his portrait at least three times. An overt homosexual (or, more accurately, promiscuous bisexual), he quickly brought offence when in Rome by writing and publishing sixteen pornographic sonnets to accompany a series of equally pornographic drawings by Marcantonio Raimondi. Fleeing to Venice, he there became a very successful blackmailer, as well as developing his sharply satirical writing. As you might expect, his mode of death was as strange as his mode of life: he was said to have died of suffocation “from laughing too much”. Anselm Feuerbach (1829–1880), The Death of Author Pietro Aretino (1854), oil on canvas, 267.5 × 176.3 cm, Kunstmuseum Basel, Basel, Switzerland. Wikimedia Commons. Feuerbach shows the exterior of an Italian villa with a wild party in full swing. In the background, a couple are making love, oblivious of what is taking place in front of them. Aretino appears to have fallen onto his back on the stone flooring, his right hand still gripping the tablecloth and bringing plates, food, and a glass toppling down on him. Next to him on the stone is a stringed musical instrument, and a small dog. 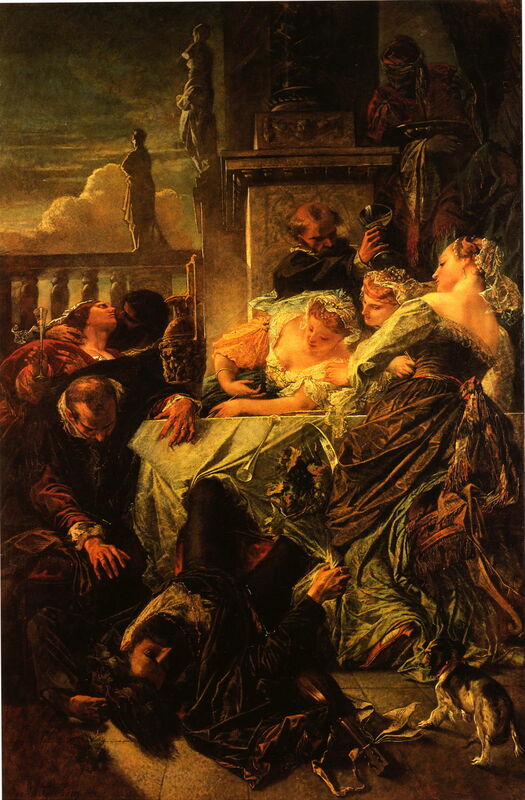 At the left, a man appears to be trying to reach Aretino, but is struggling to do so, perhaps through drunkenness, his left hand clutching the edge of the table. Around that table are three beautiful young women, who appear mildly amused at Aretino’s predicament, or are ignoring him. In the right background a man appears to be passing his empty goblet up to a black servant for refilling. The painting is a puzzle. Why Feuerbach should have any interest in such an event is a mystery, and why he should portray it in such a curious painting is unclear. As narrative, it begs many questions and answers none. We seem on safer, certainly better-trodden, ground with Medea, from Greek mythology. The sorceress daughter of King Aeëtes of Colchis, she was part of the myth of Jason and the Golden Fleece (and the Argonauts), which has very ancient origins. Inevitably there are different versions, but the basic story is that Medea fell in love with Jason, and – on the condition of their marriage on his return – helped him obtain the Golden Fleece. The most famously developed account of Medea and Jason is that in Euripides’ play Medea. According to that, Medea had two children by Jason, Mermeros and Pheres. Later Creon, the King of Corinth, offered Jason his daughter Glauce in marriage. When Jason left Medea for Glauce, Medea avenged his betrayal by killing their two children. An alternative and happier ending is that Jason and Medea fled to Corinth, where they had five sons and a daughter. 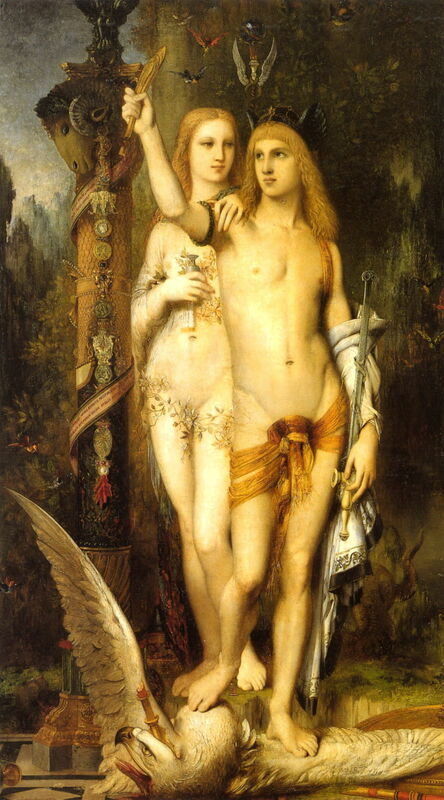 Gustave Moreau (1826–1898), Jason (1865), oil on canvas, 204 × 115 cm, Musée d’Orsay, Paris. Wikimedia Commons. When Feuerbach decided to paint Medea, he may have already seen Moreau’s Jason (1865), which I discussed here. He decided to paint something approaching its antithesis. 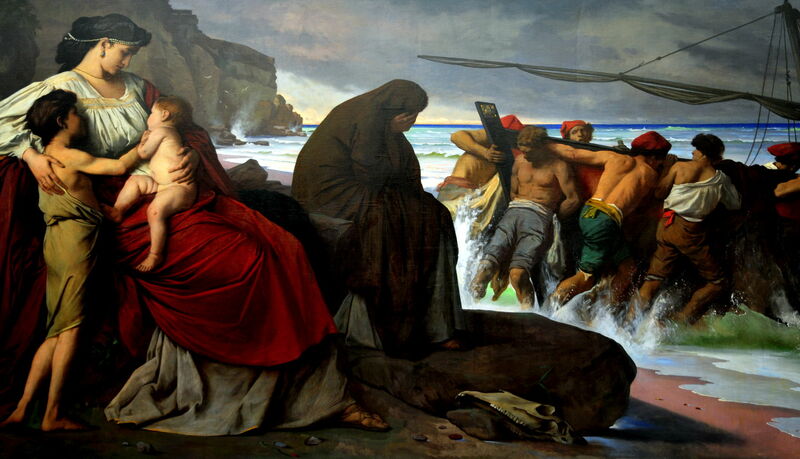 For Feuerbach, Medea is the mother of their two young children, watching as Jason and his Argonauts push their boat back into the surf to go in quest of the Golden Fleece. Presumably the woman in black is mother or mother-in-law. Medea appears almost an archetypal mother, a Madonna and infant plus one, not even looking at the departing boat. She is no sorceress, and the merest suggestion that she could ever kill those children in vengeance seems absurd. So this too is a puzzle. The Attic War, again in Greek mythology, was a conflict between the famous female warrior Amazons and the Athenians of Greece. The dead queen of the Amazons, Hippolyta, had a sister, Antiope, who was abducted by Theseus, leader of the Athenians, during the ninth labour of Heracles/Hercules. The Amazons not only wanted to rescue Antiope, but to bring back the Hippolyte Belt, which Heracles had won in that ninth labour. Despite their reputation as fierce warriors, the Amazons were annihilated in battle, as the Athenians spooked their horses, who went wild, throwing their riders and then killing them. 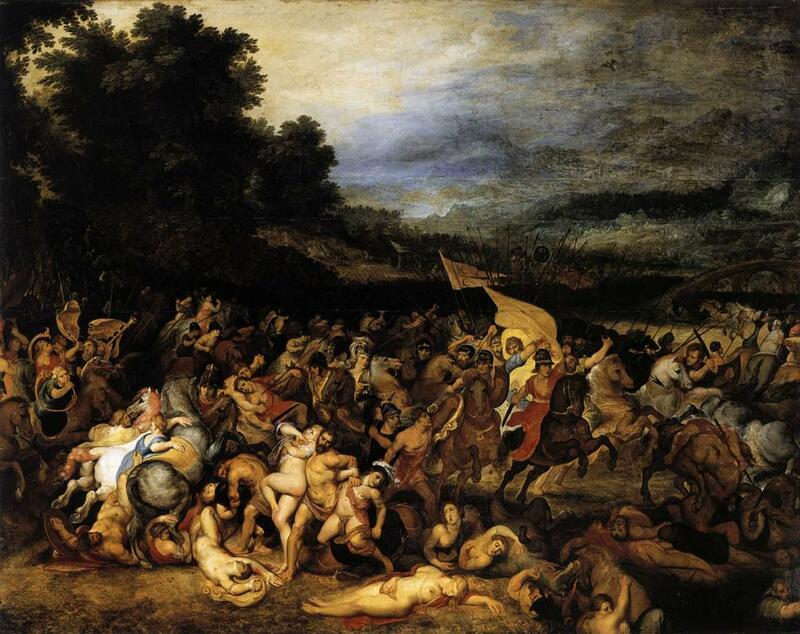 This had previously been depicted in paintings by Peter Paul Rubens (1577-1640), the earliest of which, The Battle of the Amazons (c 1600), is below. Peter Paul Rubens (1577–1640), The Battle of the Amazons (c 1600), oil on canvas, dimensions not known, Sanssouci Picture Gallery, Potsdam, Germany. Wikimedia Commons. Feuerbach’s second version of his painting appears to follow Rubens more closely. 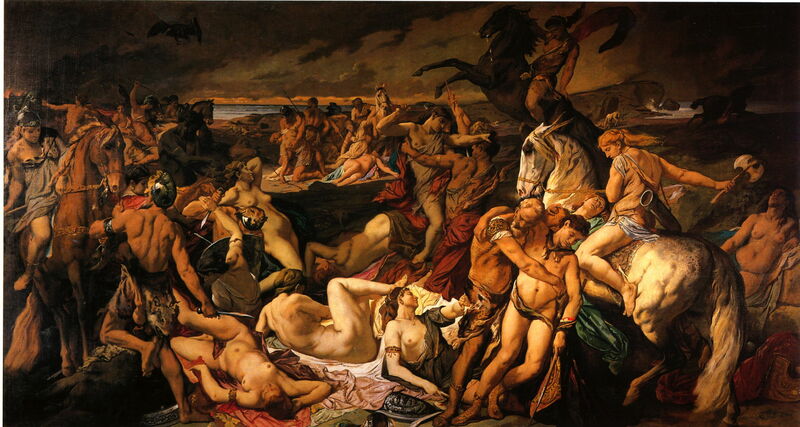 Anselm Feuerbach (1829–1880), The Battle of the Amazons (Second Version) (1873), oil on canvas, 405 × 693 cm, Germanisches Nationalmuseum, Nuremberg, Germany. Wikimedia Commons. Remarkably, amid the complete chaos, there are no signs of carnage: neither Rubens nor Feuerbach show any blood (apart from the occasional sliver on a dagger) amid the acres of bare female flesh. Although known as Plato’s Symposium, after the philosophical drinking party described by Plato in 385-370 BCE, the event is perhaps better described as Agathon’s party. For Plato set his philosophical debate at a party thrown by Agathon in 416 BCE to celebrate his first victory in a dramatic competition, the Dionysia. The debate was used by Plato to expound various theories of (predominantly male homosexual) love. The participants include Phaedrus (an aristocrat who followed Socrates), Pausanias (a legal expert), Eryximachus (a physician), Aristophanes (the famous comic playwright), Agathon (a tragic poet and the host), Socrates (the philosopher, and teacher of Plato), and Alcibiades (a statesman and orator). Feuerbach may have seen a print made from Pietro Testa’s (1611–1650) painting The Symposium of Plato (before 1648). 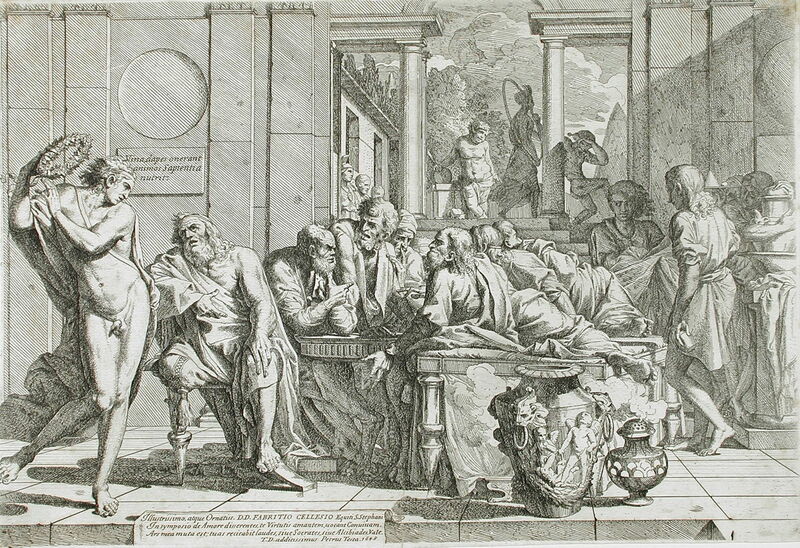 Pietro Testa (1611–1650), The Symposium of Plato (print, 1648), etching, 26 x 38.1 cm, Los Angeles County Museum of Art, Los Angeles, CA. Courtesy of LACMA, via Wikimedia Commons. Testa shows the seven participants engaged in debate around a table, a naked youth nearby, and a courtyard with statuary behind. Anselm Feuerbach (1829–1880), Plato’s Symposium (First Version) (1869), oil on canvas, 295 × 598 cm, Staatliche Kunsthalle Karlsruhe, Karlsruhe, Germany. Wikimedia Commons. Feuerbach initially made a watercolour sketch of his intended painting in 1865-6, and completed his first version of Plato’s Symposium in oils in 1869. I am indebted to Professor J H Lesher for decoding the identity of the figures. Entering from the left down the short flight of steps, almost naked, is the drunken statesman and orator Alcibiades, shown as a homoerotically-charged young man. His right arm is cast around a partially unclad female companion, and he brings with him a group of revellers, including another partially undressed woman with a tambourine. Alcibiades himself is framed by a pair of putti, the nearer with a wreath, the other with a double flute. Standing in the centre, Agathon welcomes the group, and wears the laurel crown of his victory. Around him, to the right, are the other figures of Phaedrus, Pausanias, Eryximachus, Aristophanes, Aristodemus, and Socrates, perhaps Plato too. With very few clues as to which might be which, Feuerbach does not seem to want us to identify them individually. Behind Agathon there is an opening to a courtyard garden, not dissimlar to that of Testa, but without the statuary. Detailed analyses of the paintings shown on the walls, and comparisons with Plato’s text, reveal that Feuerbach did not attempt to conform to the text, but did try to create an image which appeared convincing. So we have what looks like a careful representation of Plato’s Symposium, but which is actually not. Although it may share some narrative, Feuerbach has other intentions, which remain unclear. This first version of what Feuerbach considered his masterwork was not well received. He therefore developed a second version (third if you count the watercolour sketch of 1865-6), which was completed in 1874. Anselm Feuerbach (1829–1880), Plato’s Symposium (Second Version) (1871-4), oil on canvas, 400 × 750 cm, Alte Nationalgalerie, Berlin, Germany. Wikimedia Commons. Feuerbach’s second Plato’s Symposium (1871-4) has undergone a pictorial transformation, but consists of the same figures in essentially the same locations and relations. Other than Alcibiades and his group and Agathon, there are as few clues as to the identities of the other figures. The walls are now decorated differently, and the distant garden has changed too. But far from clarifying his narrative intent, it remains locked in the artist’s mind. Feuerbach’s narrative paintings are even more puzzling than those of Moreau, where at least we know that all we have to do is to decode their symbols and read those. Feuerbach provides us with paintings which, at first sight, depict well-known narratives. But look more carefully and each has problems in the reading. Perhaps that was his point. Lesher, JH (2008) “Feuerbach’s Das Gastmahl des Platon and Plato’s Symposium” in P. Castillo, S. Knippschild, M. G. Morcillo, and C. Herreros, eds., International Conference: Imagines: The reception of antiquity in performing and visual arts (Logroño: Universidad de La Rioja, 2008), 479–490. Available here. Posted in General, Painting and tagged Feuerbach, narrative, painting, Plato, Rubens, Symposium, Testa. Bookmark the permalink.